St. Patrick’s Day in Chicago is a pretty big deal. Everyone in the city is Irish on March 17. 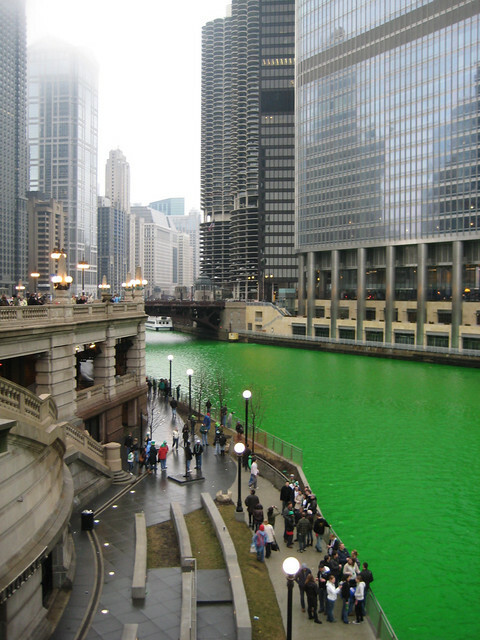 The entire metropolis turns into a party starting around 10 AM when the river is dyed green. It is shocking how green it gets! I always assumed that the city bank rolled the color job but apparently it is privately funded. The photo below is from 2010 which was a cold and dreary day. They are predicting 70+ degrees for Saturday so I can only assume that will add to the mayhem around here! I get to spend this St. Patrick’s Day with some of my favorite people. I can’t wait! My mom has even hinted that she might try a green beer…. I don’t think she has had a beer in her life. That should be interesting. I wanted to provide some Irish themed food to snack on, but did not want to use green food coloring. I turned my focus to naturally green ingredients like vegetables, pesto, and well, I guess that is it. I remembered reading about edamame hummus and thought that would be the perfect party food. Not only would it be naturally green it would be healthy! 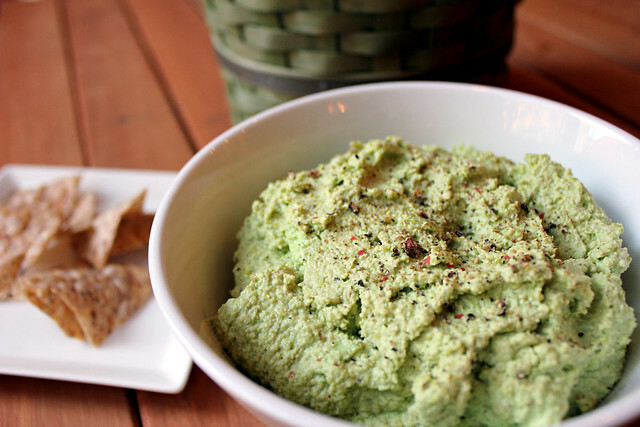 This edamame hummus is flavored with tahini, lemon juice, and roasted garlic. Roasted garlic is a very good thing. Roasting the garlic completely transforms the flavor so it is almost sweet. You can even spread it directly on crostini. Yum. To roast an entire head of garlic you just chop off the top and remove most of the outer papery layer, drizzle with olive oil, wrap in foil, and roast until it is golden and soft. Before going into the oven…. The edamame hummus was slightly sweet from the roasted garlic and had an earthy taste from the tahini. It was a lovely shade of green, which makes it the Perfect Pairing for St. Patty’s Day! Preheat your oven to 400 degrees F. Cut off the top of the head of garlic, remove outer papery layer, and place on a sheet of foil. Drizzle the top with 1 Tb olive oil. 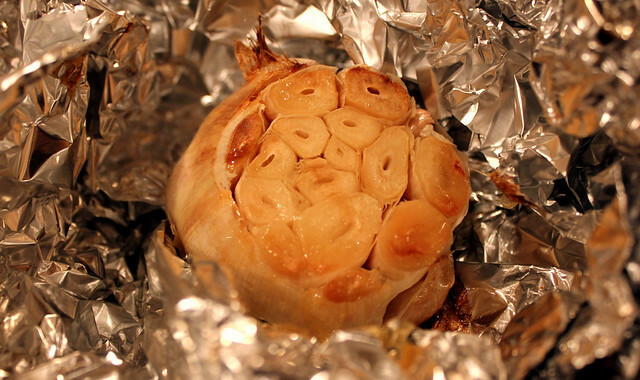 Wrap the garlic in the foil and roast in the oven until soft and golden, about 40-50 minutes. Bring a medium pot of water to boil, add the shelled edamame to the boiling water. Cook for 4 to 5 minutes, drain, and rinse with cold water. In the bowl of a food processor add the edamame, lemon juice, ½ teaspoon of salt, tahini, and dash of cayenne pepper. Pulse until well combined. Add in 4-6 cloves of roasted garlic. Pulse until the hummus is completely smooth. Taste for seasoning and add salt and pepper to taste. I love edamame hummus! I love the idea of using roasted garlic - I bet it adds extra loveliness. The recipe I have calls for parsley, paprika, and cumin. I'm going to try yours soon! It is really a great pair...Thanks for the post. This recipe looks delicious today i have guest this recipe nice choice for me ..thanks..